Four years since the original launch of its multi-trip pallet box – the Trip Box – Goplasticpallets.com has introduced a new, improved version to its range, which promises to deliver superior strength, better security and enhanced performance for large volume goods handling and distribution. 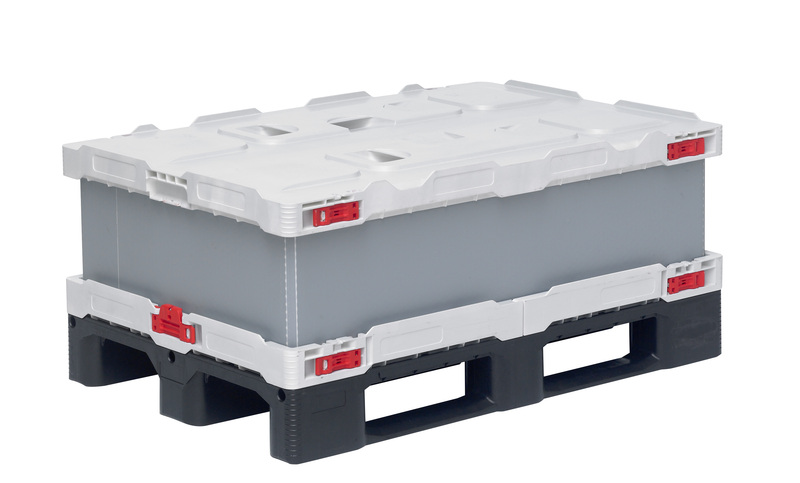 Designed by Belgium-based plastic pallet and pallet box manufacturer Smart-Flow, the new Go Trip Box 1208 Ultimate 3R boasts a stronger, more robust pallet base; a lockable pallet base and lid to secure the pallet sleeve in place; a durable, injection moulded lid – in contrast to the original thermoformed lid; and the option to choose from different sleeve thicknesses. In addition, the pallet base can be reinforced with three metal bars to accommodate heavy loads in excess of 500kg, increasing the racking capacity of the pallet box to 900kg. 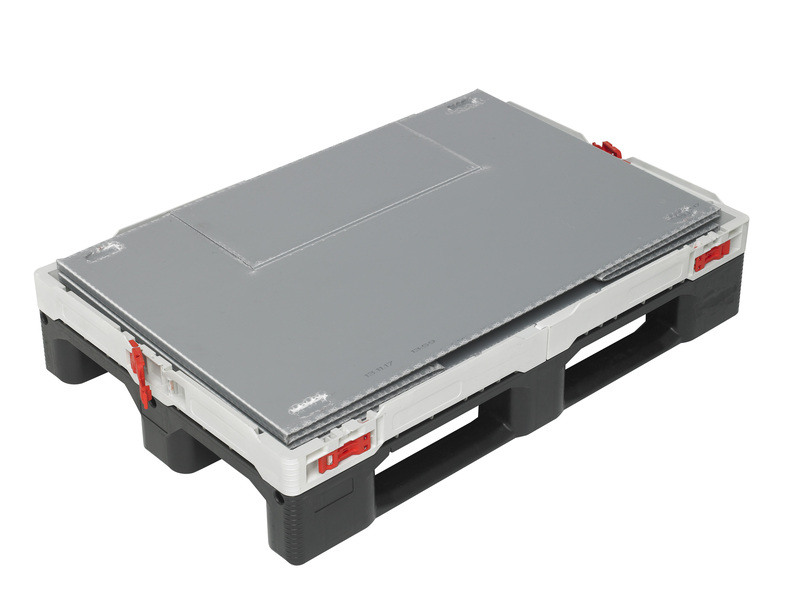 Quick and easy to assemble and disassemble, the new, improved Go Trip Box 1208 Ultimate 3R is comprised of three components – a recyclable plastic pallet base which measures 1200mm (L) x 800mm (W), a sturdy but lightweight plastic sleeve and a durable plastic lid. When assembled the new Trip Box has a storage capacity of 516 litres and can be stacked and stored safely up to four boxes high with a maximum load of 1600kg. When not in use the multi-use pallet box folds virtually flat – the plastic sleeve slots into a groove around the pallet edge and the lid locates easily on top. In folded-down mode, the Go Trip Box 1208 Ultimate 3R can be stacked up to eight boxes high, saving considerable space in storage as well as reduce costs on return journey trips. Unlike other sleeve pack systems on the market, both the pallet base and lid are injection moulded to offer superior strength and rigidity, meaning the new, improved Trip Box can be used repeatedly, across multiple trips to and from the warehouse. Where most other systems traditionally come on nine feet, our multi-use pallet box comes on three skids making it suitable for applications where racking is required. Just some of the applications the Trip Box is currently being used for include car parts, electronic components, retail goods and pharmaceuticals. The pallet sleeve can be custom made to different heights to meet customers’ specifications and is available in a variety of thicknesses. The sleeve is also available with a drop down door for easy access loading and unloading goods. 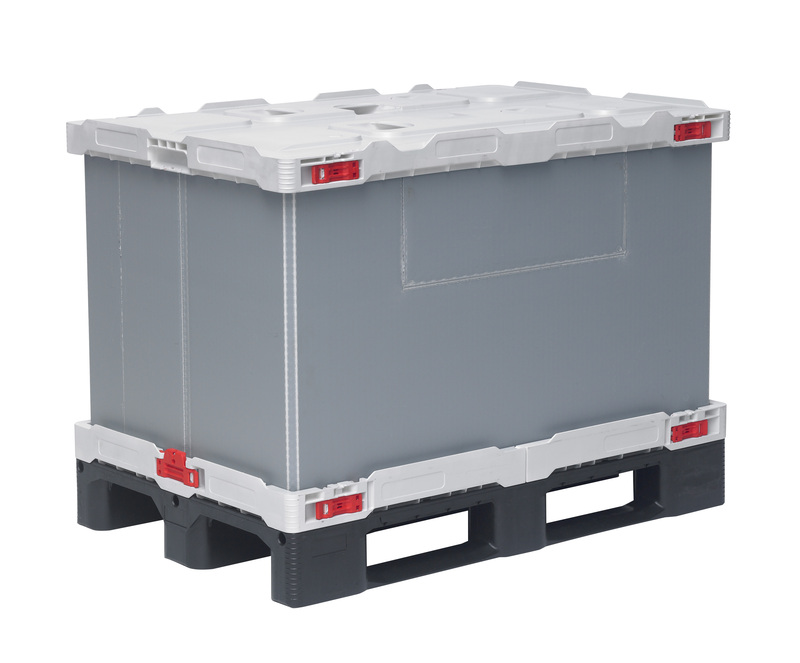 The multi-use pallet box comes as standard with a black pallet base and lid and a grey sleeve, however for large orders other colours are available – like those seen in these photos. Other personalisation options include the addition of label holders and branding with a company name or logo. Arrange a demonstration today by emailing our pallet box experts on [email protected] or to discuss your requirements, call us on 01323 744057. Alternatively, visit www.goplasticpallets.com to explore the UK’s largest range of recycled plastic pallets and pallet boxes.